Four years ago we experienced the beginning of the worst recession since the great depression of the 1930s. It's pretty clear that we won't be able to recover from this recession as rapidly or as well as we have from all of the other recessions that occured between the great depression and now. Both of our political parties blame the other for not enacting legislation that will bring the Country out of this slump and return our economy to the levels that existed prior to the collapse. However, when we understand what was driving the artificially robust economy for the past several years and why those drivers are not sustainable, we begin to understand why it will be years before we see sustained economic growth anywhere near the levels we experienced in the past few years. The individual income tax has been the largest single source of federal revenue since 1950, averaging 8 percent of GDP (Gross Domestic Product). Payroll taxes swelled following the creation of Medicare in 1965. Taxes for Medicare, combined with periodic increases in Social Security taxes, caused payroll tax revenue to grow from 1.6 percent of GDP in 1950 to 6 percent or more since 1980. Payroll taxes also include railroad retirement, unemployment insurance, and federal workers’ pension contributions. Revenue from the corporate income tax fell from between 5 and 6 percent of GDP in the early 1950s to 1.3 percent of GDP in 2010. In 2010 the federal government collected $2.2 trillion, an amount equal to 14.9 percent of GDP. $924 billion (42%) of the above total came from individual income taxes. Roughtly $340 billion (~37%) came from individuals earning more than $344,000 who compromise the top 1% of income earners. In 1981 the supply-siders commanderered the Reagan Presidency and employed their "Voodo Economics" as Bush senior had called it in 1980. 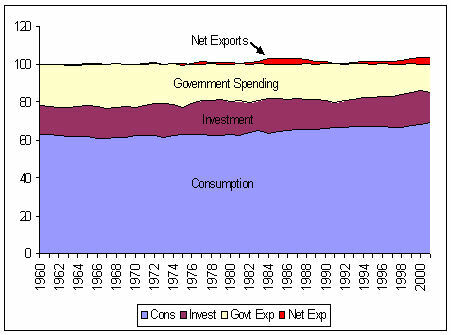 Spending was supposed to stimulate the economy, resulting in a larger GDP and more than offset the deficit spending. 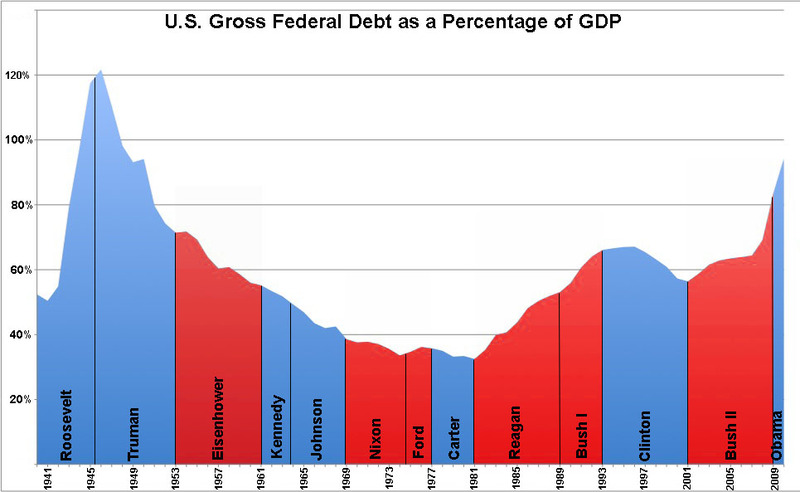 This resulted in massive deficits and steep increases in debt as a percent of GDP (Gross Domestic Product). For the following twenty years, under Reagan and the Bushes, the national debt increased every single year, with the exception of the Clinton years. The Obama administration was the recipient of carry-over deficit spending as a result of unfunded wars in Iraq and Afganistan and an unfunded Medicare Part D drug program passed during the second George Bush Presidency. The added expense of the recovery efforts to overcome the collapse of the economy that occured at the end of the second George Bush residency added to the resulting deficit spending that continues to plague us today. The deficit spending has resulted in not only a huge national debt, but also the threat of increased carrying costs to pay the interest on the debt. Currently, this carrying cost has actually become smaller as a result of the historically low interest rates fostered by the Federal Reserve Bank. However, when interest rates rise, the carrying costs will rise in lock step and will result in dramatic increases as the debt continues to rise over time. 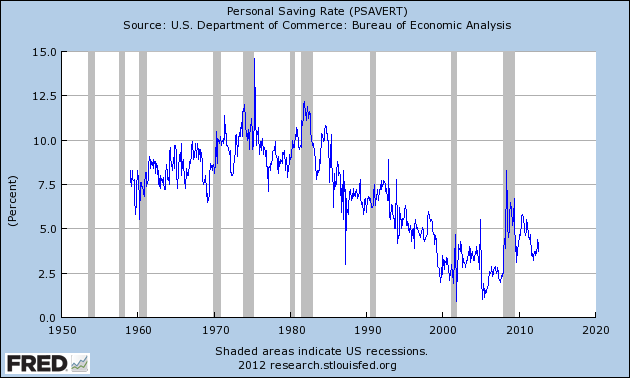 Meanwhile, personal savings rates deteriorated as individuals spent savings to make purchases, depleting their savings which will now have to be replaced at the cost of fewer goods and services being purchased. Not only did consumers deplete their savings, they also took on massive debt to, in many cases, live beyond their means. As with the federal deficit, there is a limit to how much debt a person can manage. The recent collapse of the financial community and economy in general has made borrowing more difficult. 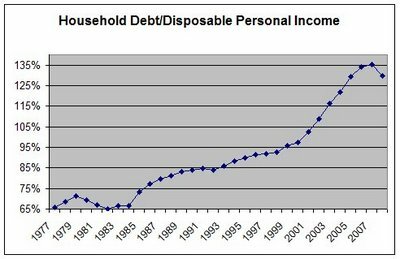 The below graph shows household debt as a percent of disposable income. In addition, during this same period, there has been a dramatic shift in how income in the U.S. is being distributed among different income groups as shown in the graphs below. The top 1% have seen their share of the total U.S. income rise from 10.5% in 1979 to 21.3% in 2007. At the same time, the middle three fifths of the wage earners saw their share of the earnings drop from 47.8% in 1779 to 38.5% in 2007. The following graph shows the same trend in a different way. It's pretty obvious that the policies in effect between 1979 and 2007 have resulted in much of the wealth created in the U.S. in that period going to the top 25% and 1% of wage earners while the rest fell behind. About 70% of the GDP of the U.S. is consumption by the people who buy goods and services. If the above trend in wealth distribution continues, there will be fewer and fewer people who can afford to purchase those goods and services. Contrary to what the politicians say about creating jobs by lowering taxes on small businesses and eliminating government regulations, jobs are created by consumers in the U.S. economy. "Build it and they will come" only works when those who come have the money to make the purchase. You'll also notice in the graph above that Government spending is a significant portion of the GDP. Any reduction in Government spending in an attempt to rein in the growing debt will also unfavorably impact the GDP which drives jobs and income for the workers who produce the GDP.